The FX 3 series was released by Vy-Tek in 2009. The FX line is one of the best-selling medium-sized format laser systems available. The FX 3 comes in three standard sizes with a range of working areas beginning at 2’ x 3’ (610 mm x 910 mm). Our FX 3 series systems are gantry-based XY systems that use a flying optic beam to deliver ultra-light gantry designs. The system allows for high accelerations and high positional accuracy to exist simultaneously. The FX 3 has precision polyurethane steel-reinforced belts that both drive the X and Y axes, with the Z axis moving up and down to a fixed head assembly. Our multi-deck Z axis (table system) integrates the engraving deck, the slat bar cutting surface and more. In addition, our FX 3 systems include a unique cutting head attachment that allows for a cutting nozzle and several choices of focal lengths. 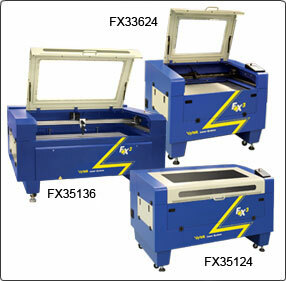 Our FX 3 series systems are some of the best-selling medium-sized laser systems available through Vy-Tek and elsewhere. To learn more, contact us, and visit our product information pages to learn more about other Vy-Tek products. Vy-Tek has a rich history of mastering the use of laser technologies so that you don't have to. For over 20 years, we’ve delivered the broadest possible range of engraving, marking and cutting solutions. We design each product to specific standards with common software and hardware components in order to provide reliable performance and profitable operation for years to come. Vy-Tek Laser has been manufacturing laser cutting, engraving, and marking equipment and software for a wide variety of markets and applications since 1989. We develop our wide range of laser-based technologies at our state-of-the-art engineering and manufacturing facilities in Fitchburg, Massachusetts. We design our products to work seamlessly within your company and environment. We don't settle with product creation and production, we standardize straight-forward equipment training. We even run an independent service bureau so that you can try samples of products before you decide to purchase a system or application. We not only provide you with optimal and reliable cutting, marking and engraving tables. We also help you become a master of our Vy-Tek systems quickly to help you become more profitable. Let Vy-Tek Laser be your choice for laser cutting, engraving and marking equipment and software. Vy-Tek is proudly designed in the U.S.A., manufactured in the U.S.A. and supported in the U.S.A.